Barley is traditionally cooked in casseroles and stews, which are great family meals in winter. They are such comforting foods for an Australian winter. I wanted to create a special dish which will have barley as a central and honoured ingredient. So, here it is, my longest cooked meal out of all my recipes. I love it and cannot have enough. You could cook it Bianco and freeze in portions. Then whenever you feel like a healthy hearty meal you could finish them with various additions, such as pumpkin or zucchini, capsicum or fennel, lamb or chicken. 1. Use a coffee grinder to process all barley in small batches. Just pulse twice each batch. 2. Put all processed barley into a pot or bowl with lid, season, pour boiling water over, cover and put aside for an hour. 3. In the meantime, bake pumpkin in the oven at 175C for 20-30 minutes or until soft. Do not overcook. The pumpkin should keep its form. 4. While waiting for barley and pumpkin, dice chicken thigh fillets into approximately 2cm pieces. Mix with minced garlic, olive oil, salt and pepper, cover and leave aside for 30 minutes. 5. If you chose to use dry porcini, break into smaller pieces and cover with 1/2 cup of boiling water. For wild mushrooms, thoroughly wash, boil for 1 minute and drain. 6. Heat oil in a deep pan and cook diced onion for 5 minutes on low heat. Add barley and 1 cup of stock, simmer until the stock in fully absorbed. Taste for seasoning, add salt and pepper if required. Repeat 3 more times with the stock. Cooking barley in this step may take up to an hour, ensure barley is soft enough to your liking. 7. Cook chicken in a separate frying pan on medium heat for about 10 minutes, then add the chicken to the barley when barley is ready. 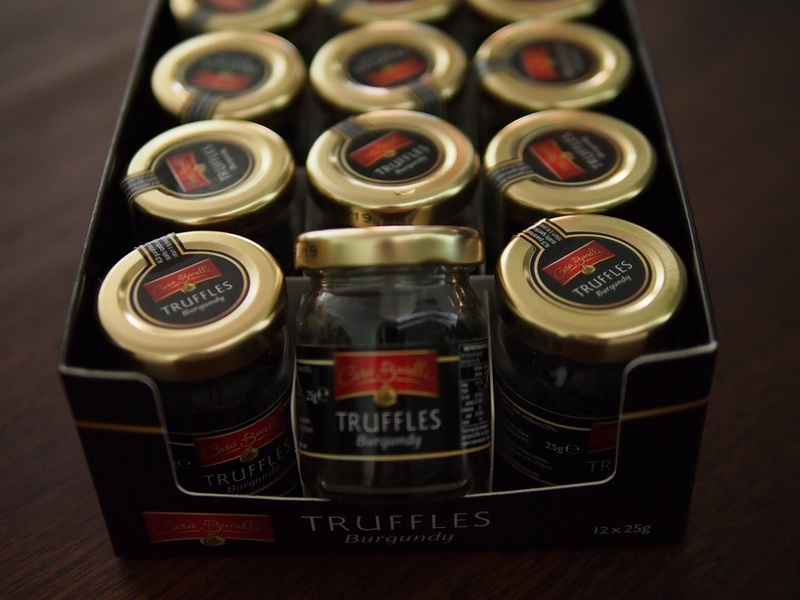 Grate truffle if using it and a half of nutmeg over the pan. 8. Wild mushrooms can be added in this step. If dry porcini were soaked, do not drain them and use the water along with the mushrooms. 9. Cook until mushrooms and chicken are ready. 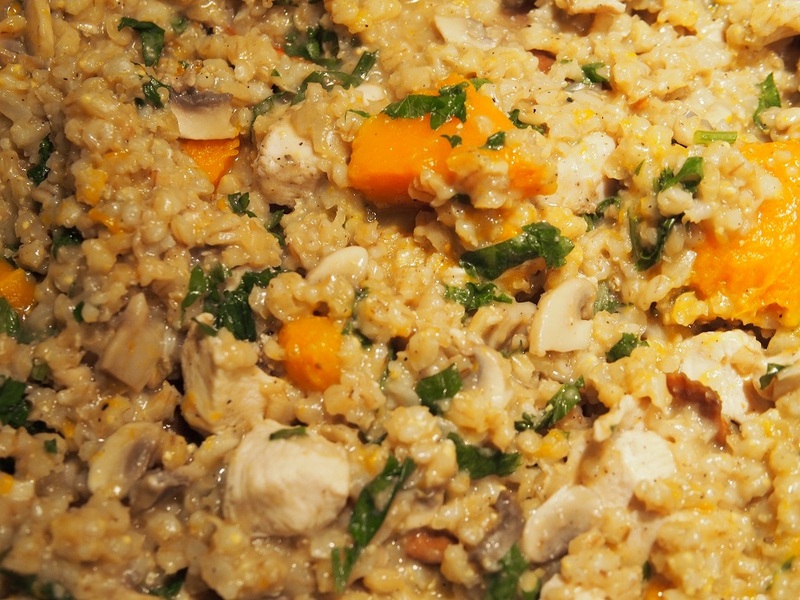 Cut roasted pumpkin into small pieces and mix into the risotto. 10. At the end of cooking add sliced cup mushrooms, the remaining stock, ghee and just heat through, mushrooms need to remain juicy and crunchy. Sprinkle risotto with parsley and serve with the slices of ripe sweet tomatoes dressed in olive oil.